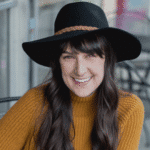 January 21, 2019 By Liz 26 Comments Note: This post may contain affiliate links. New year, new snacks! Like most people, I jumped into 2019 ready to eat a little cleaner. I enjoyed my fair share of Christmas cookies and holiday goodies and I was really excited to get back into a regular routine of healthy habits. But that doesn’t mean I put my sweet tooth to rest. I just decided to come up with some healthier options! I love snacking on Greek yogurt because the protein keeps me full and there are endless options when it comes to toppings. I’m excited to partner with FAGE because I’m obsessed with their yogurt. It is so thick and creamy. Not to mention, the ingredients list is simple. It’s made with only milk and live active yogurt cultures- that means probiotics! 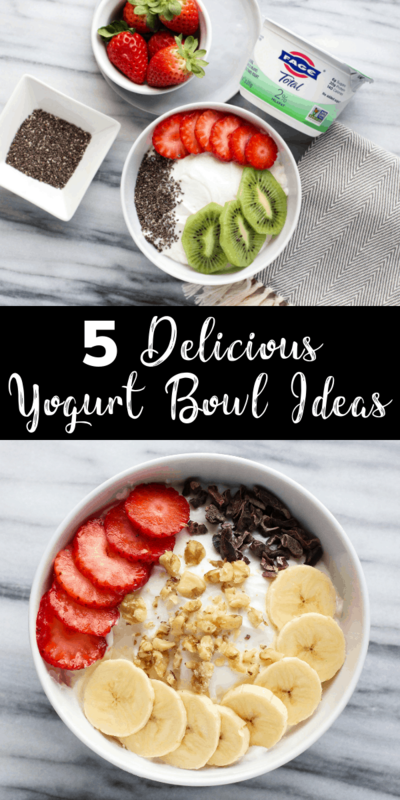 I thought it would be fun to give you some ideas to switch up your yogurt game. No matter what you’re craving, I’ve got a bowl to satisfy! 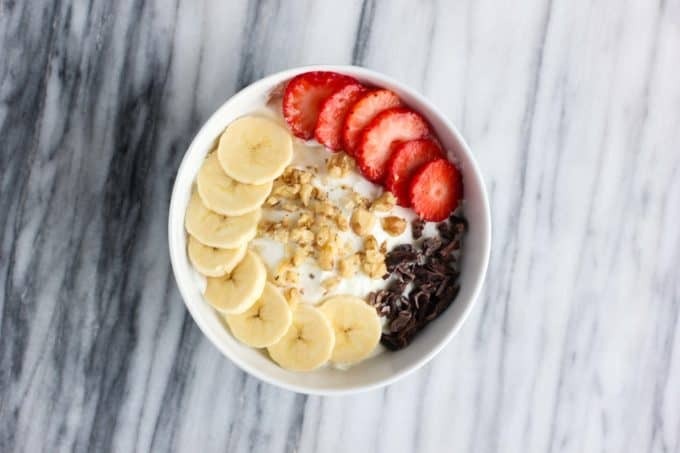 Top your FAGE Total 2% Greek yogurt with banana slices, strawberry slices, cacao nibs, and maybe even a cherry on top! It’s like your favorite ice cream sundae, but healthier! I love how the fruit adds sweetness and the cacao nibs give it a nice crunch without added sugar. 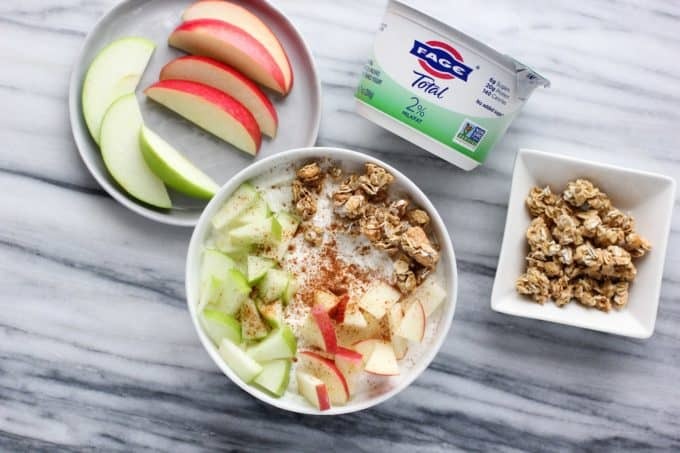 Dice up an apple (I used a combination of Fuji and Granny Smith) then sprinkle the pieces over your bowl of FAGE yogurt. Add a dash of cinnamon and a handful of granola! You could even add a splash of vanilla extract to your yogurt, for an extra dessert-like twist! You’ll feel like you’re on a tropical island when you dig into this one! 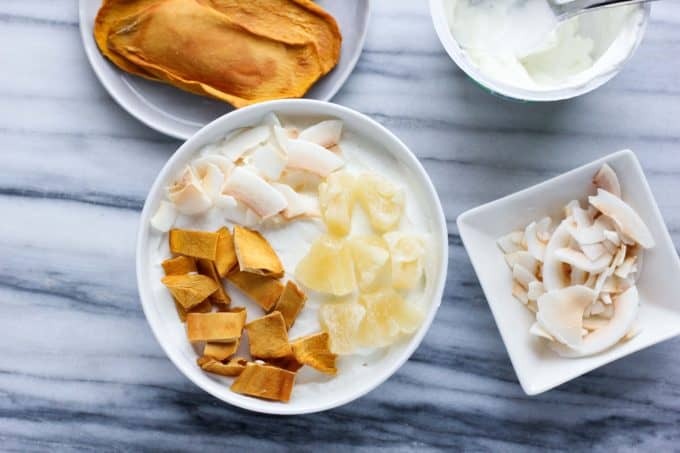 Top your FAGE yogurt bowl with chopped dried mango, dried pineapple, and toasted coconut! Keep an eye out for no-sugar-added forms of dried fruit. Alternatively, you could top it with fresh or frozen fruit! 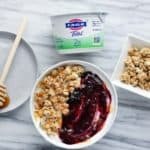 This FAGE yogurt bowl is tasty enough for dessert but healthy enough for breakfast. 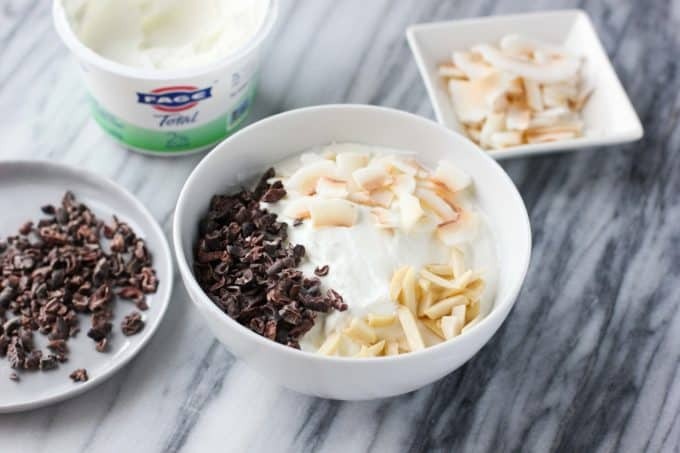 Top your bowl with cacao nibs, coconut flakes, and sliced almonds. You can even add a sprinkle of cocoa powder on top if you like things extra chocolatey! This fruity combo is like sunshine in a bowl. 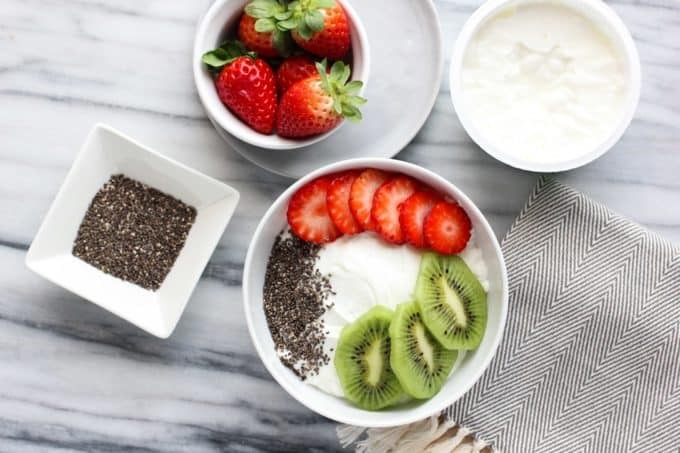 Top your FAGE yogurt bowl with slices of kiwi and strawberry, then sprinkle a tablespoon of chia seeds on top! Chia seeds are packed with healthy fats, protein, and fiber so they help keep you energized. I’ve found myself reaching for FAGE Total 2% Greek yogurt when I want a snack because it’s so satisfying. Thanks to all the protein, it actually keeps me full. It’s been such a great way to refuel after exercise or satisfy my sweet tooth when a craving hits! 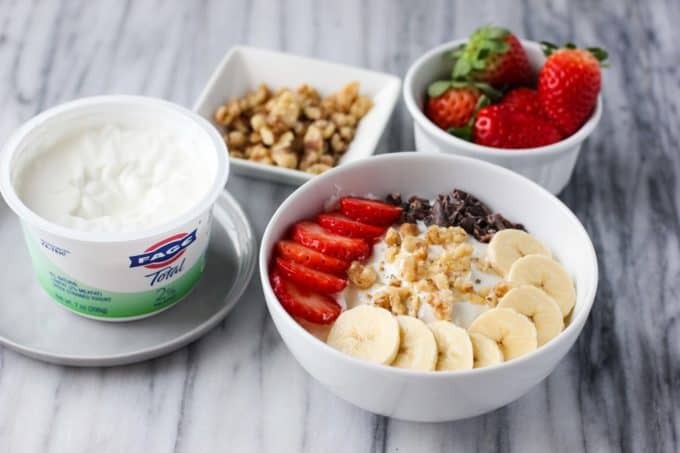 What’s your favorite way to top your yogurt bowls? So many options for yogurt bowls. 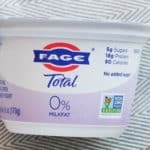 Now you have me hungry for Fage! It’s the best! So creamy! Those are all yummy bowls. Will have to try to make soon. I’m loving all of these ideas. It’s also getting me to think about adding more than just one item to my yogurt. Thanks! Yay! I hope it’s helpful inspiration, Andrea! I love how different and creative each of the bowls are. I especially love the one with the cocoa nibs. Brilliant! 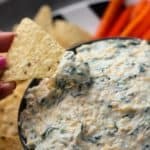 It’s amazing how versatile Greek yogurt can be! Great ideas for breakfast! loved them. I love all these yogurt bowls. The Chocolate Coconut Almond looks especially delicious. Can’t wait to try these out. I hope you give them a try, Sharon! They all look so good! I’m definitely going to have to work my way down the list. Thanks for the great ideas! You can never go wrong with strawberries! There is not one bowl I will not be making here! These all look incredibly delicious! Thanks for all the great ideas! Haha yay! Glad you like them, Cathy! I eat a Fage yogurt bowl almost every single day. Thanks for some new ideas! Yay!! I love having these for breakfast or a nice snack! Love all of these different options! I’m leaning toward the kiwi strawberry one right about now! These all look delicious but that banana split bowl is really speaking to me! Fage is terrific yogurt. Beautiful yoghurt bowls these are and so healthy! I love them all! Pinned! This post made me so happy! I have a yogurt bowl each night, and I’m always looking for new ideas for add-ins! The banana split bowl and apple pie bowl are calling my name! I really like savory yogurt bowls for lunch lately. I add chopped cucumber, a little toasted sesame oil, grape tomatoes, crumbled nori, and bean sprouts. Whatever veggies i have around plus the sesame oil and a little soy sauce is amazing! That such a fun idea!’ I need to try that! Hi these look like great breakfast options. I would really like access to your I Heart Vegetables Group Board & the other Vegetable Group Board you have. 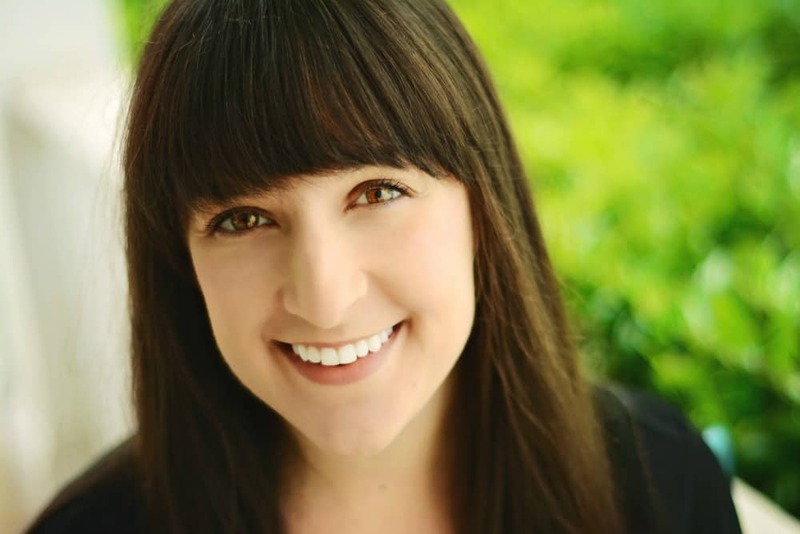 I’m on Pinterest MaryAnn Coy no websitem, yet but I have Gout & need to eat less meat & more vegetarian, which I like any how.so if you can squeeze me in & send me some invitations I would be really happy! Thanks.